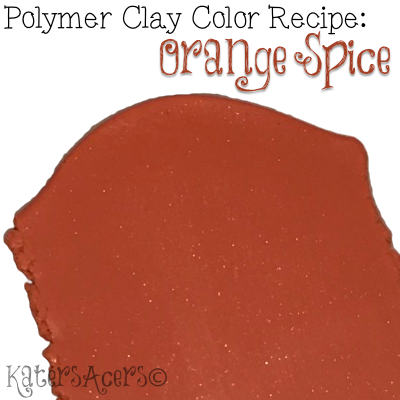 Premo color recipe in Orange Spice for polymer clay. A few weeks ago I introduced you to the Fall 2017 color recipes. I hope that you’ve taken some time to look through them and enjoy them as well. What would fall be without a gorgeous, rich, orange spice color to liven up the bunch? Add 1 more part Alizarin Crimson for a darker orange tone but be careful as too much will quickly verge to a red toned color. Add 1 more part Cadmium Yellow to lighten the depth and darkness of your orange. Pairs well with the darker colors in the palette as well as almost black colored acrylics or inks to help it stand out in the crowd (get my recommendations here).